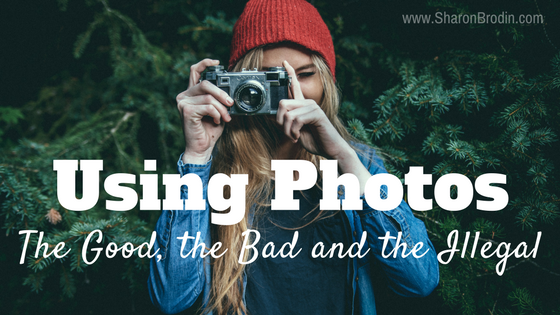 Using photos in marketing is a wide-spread and recommended practice. There are good, bad and illegal ways to use them, though, and what you don’t know can hurt you. Back when everything was just in print, it was a lot more work and expense to get and use photos. These days, the digital revolution has made it so easy that many have either forgotten, never knew or ignore some basic principles—and laws—for using photos. a. Use it as-is, because the bigger the better. b. Reduce the file size down significantly for speedy load times. c. What does “22mb” mean? If you answered c: mb is short for megabyte. The average phone takes a photo that’s in the neighborhood of 1-6 mbs. The average digital SLR camera takes a photo that’s more like 20 mbs. Here’s what’s important: Hardly any photos need to be over 1mb online! In fact, most screens can’t display the difference between a 20mb photo and a photo that’s just a couple hundred k (kilobyte—there are 1,000 k in a mg). So what? Well, bigger photos take longer to load. Sometimes a LOT longer. That means your web pages or emails using them are cumbersome, and your visitors and readers are waiting…and waiting. That’s bad! I always reduce the size of photos I use online. The one at the header of this email is only 338k. If you’re a Mac user it’s easy to use iPhoto for that. If you’re not, here are some suggested free or cheap photo editors for Windows. This ensures speedy load times. That’s good! a. Snag it as quick as you can and use in your blog post, with a photo credit. b. Go to one of the royalty-free photo sites and look for one similar, and pay to use it. c. Email the photo’s copyright owner and ask permission to use their photo on your site. d. Take one of your own that’s similar. Photos (and all other images) fall under created works in US copyright laws. They don’t have to have the © symbol on them to be legally copyrighted. And you can’t use someone else’s copyrighted work in your work without permission. That’s illegal! Adding a photo credit doesn’t cut it if you don’t have permission. I know people do it all the time. But if the photo owner happens to see his photo on your site, he can pursue legal action. That’s bad! This happened to a blogger a couple years ago. Here’s her story about how she was forced to fork over a few thousand dollars over using one photo (that wasn’t hers) on her blog. That’s very bad! But think if YOU were the owner of those copyrighted works. You’d want your work protected, and not freely available to everyone anywhere. Especially if that’s how you make your living. So I get it. I’ve found most people (who aren’t professional photographers) are very generous with giving permission. Get it in writing and file it. These are only two of many possible questions about using photos. Thanks to the digital world, producing and using photos has never been easier. But educating yourself on best-practices and legalities is a must. Why Use an Email Marketing Service?